Subway ridership hit a 65-year high in 2014, serving 1.75 billion trips last year, the most since the New York City Transit Authority was formed in 1953. That’s an increase of 2.6 percent over 2013 and 12 percent since 2007, according to the MTA. The subway now serves 5.6 million passenger trips on an average weekday, and 6 million on an average two-day weekend. The new figures don’t include bus ridership, which has stagnated since a round of service cuts in 2010. However, the growth in subway ridership is a good indication that the transit system continues to absorb the vast majority of additional travel in the city, a trend that goes back to the 1990s. Meanwhile, Governor Andrew Cuomo still hasn’t put forward any ideas to close the $15 billion gap in the MTA’s five-year capital program, which keeps the system from falling apart, adds capacity, and modernizes signals and stations. Weekday ridership on the L train increased 4.7 percent, with every station on the line seeing an increase in passengers. Stations in Bushwick saw the largest increases, with weekday ridership at Bushwick Avenue-Aberdeen Street jumping 11.5 percent over the year before. M train stations in Williamsburg, Bushwick, Ridgewood, and Middle Village saw ridership grow 6.2 percent last year, and are up 23.6 percent since the M was rerouted to serve Midtown in 2009. Long Island City also saw big gains, with weekday ridership up 9.7 percent at Court Square and 12 percent the Vernon Boulevard-Jackson Avenue 7 station, where ridership has more than doubled since 2000. The fastest growth in the Bronx was along the 2 and 5 trains, up 3.7 percent. In Manhattan, ridership grew fastest for the 2 and 3 trains on Lenox Avenue, up 3.7 percent over last year. Stations in the Rockaways, which rank among the system’s quietest, saw the highest percentage increase in subway ridership, with many nearly doubling the number of passengers served, as the area continues to recover from Hurricane Sandy. The subway is hitting record ridership during off-peak hours, which is when most maintenance work is performed. That maintenance is more necessary than ever: The subway also had a dramatic increase in delays last year. Advocates pressed Governor Cuomo and the state legislature to take action before it’s too late. 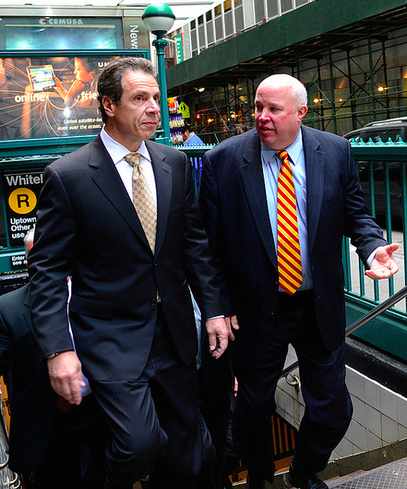 At other points in this nation and state’s history, when we were less encumbered by built up special interest privileges and past debts, there would be plans afoot for even more subway expansion. As in other countries. Instead, there is no funding for ongoing normal replacement, which has been funded by debt and federal money for 20 years. So sensible planning would include planned shrinkage. Or perhaps bankruptcy. “Does Cuomo Care?” Of course he does! These subways are too crowded, so we need to get more people out of ’em and into cars to drive on the New Bridge we’re building! Cuomo’s legacy will be the destruction of the transit system, and thus the city’s economy, and thus the state’s economy. I hope the poop hits the fan when he’s running for president. Let him explain himself then. It’s a generation’s legacy. He just happened to be the one standing when the music stopped. Unless they can just borrow another $20 billion somehow. Congestion pricing via Move NY is so blatantly necessary. In some places the bus service is so much poorer that it directly contributes to more people riding the subways—when one way to accommodate more riders would be to expand bus service. This is the case in the Bronx. Cross-town buses are so slow and unreliable that it often makes for a more comfortable ride (about same travel time) to simply ride the subway down to the Hub or 125th St, transfer, and then back up along the opposite line. SBS treatments along critical cross town routes and even bus lines that mirror the subway would go a long way to reduce overcrowding, drawing local trips. Fordham Road, East Tremont and 161st/163rd Streets should get full BRT treatment including centrally located physically seperated lanes. Seriously though, how much you wanna bet the primary reason Cuomo was interested in heading to Cuba was his love for classic cars? It’s on every Cuba tourism guidebook.